Researchers at the Stanford University School of Medicine used two novel agents to activate immune system T cells in tumors. The immune-boosting treatment destroyed most traces of cancer in mice the researchers reported in a study published on Jan. 31 in the journal Science Translational Medicine. Injecting tiny amounts of two immune-stimulating agents directly into solid tumors in mice can eradicate all traces of cancer in the rodents, including distant metastases, the researchers found. The novel approach works for many different types of cancers, including tumors that arise spontaneously, the new study found. Ronald Levy (left) and Idit Sagiv-Barfi. Credit: Steve Fisch via Stanford Medicine. The Stanford researchers believe the local application of minute amounts of these agents could be a rapid and inexpensive cancer treatment that is unlikely to cause the adverse side effects often observed with body-wide immune stimulation. One of these agents is already approved for human use, and researchers have tested the other in unrelated clinical trials. Researchers launched a clinical trial in January to assess the effect of the novel treatment in patients with lymphoma. Cancer is a disease of aging and the odds of getting it increases with every birthday. About half of those living in industrialized nations will develop cancer during their lifetimes, usually after the age of 40. Controlling cancer is an essential part of extending human lifespans and reducing pain and suffering due to ill health. While scientists are not exactly sure what causes it, they suspect that cancers are caused by DNA damage, genetics, weakened immune systems, or environmental exposure to carcinogens such as cigarette smoke or other toxins. 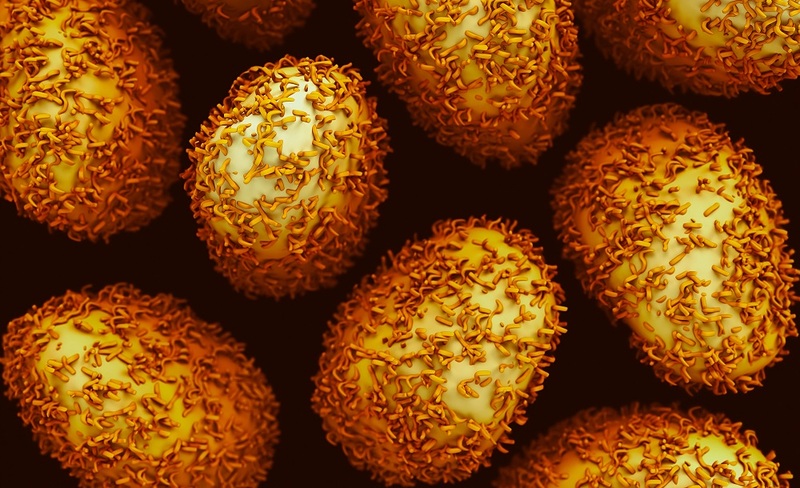 In the past few years, the rapidly advancing field of cancer immunology has produced several new methods of treating tumors called cancer immunotherapies. Specialists in the cancer immunotherapy field try to harness the power of the immune system to combat tumors. Immunotherapies either counteract the signals produced by cancer cells that suppress the immune response or stimulate specific components of the immune system to get them to attack a tumor. 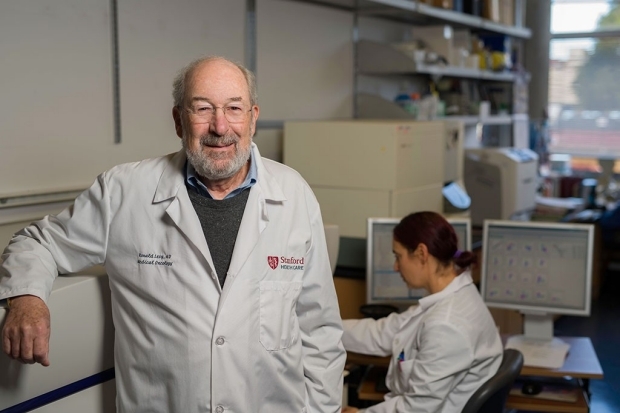 Dr. Levy is a pioneer in cancer immunotherapy and earlier work in his lab has led to the development of the monoclonal antibody rituximab, one of the first of its kind approved as a cancer treatment in humans. Rituximab (Rituxan®) is a therapeutic antibody – a type of man-made antibody designed to destroy tumors by targeting a protein on the surface of cancerous immune system cells. Rituximab has become a mainstay in the treatment of some types of B-cell lymphomas and B-cell chronic lymphocytic leukemia. Rituximab coats the cancer cells and them by triggering a form of cell death known as apoptosis as well as other tactics. Dr. Levy’s new approach is not a true cancer vaccine, but rather a highly targeted form of immunotherapy. There are two forms of vaccination; cancer treatment vaccines and cancer vaccines to prevent the onset of the disease. Cancer treatment vaccines work similarly to Dr. Levy’s approach, in that they are designed to treat cancers that have already developed by strengthening the body’s natural defenses against the tumor. These cancer vaccines are usually made from a patient’s own tumor cells or from molecules produced by these cells. In 2010, according to the NCI, the FDA approved the first treatment vaccine for cancer called sipuleucel-T (Provenge®), for use in some men with metastatic prostate cancer. Researchers are testing other therapeutic vaccines in clinical trials to treat a range of tumors, including breast, brain, and lung cancer. Tumors often exist in limbo with regard to the immune system. Immune cells such as T cells recognize the abnormal proteins found on the surface of cancer cells and infiltrate the tumor to attack. However, as the tumor grows, it often devises clever ways to suppress the activity of the immune cells. Dr. Levy’s method reactivates these cancer-specific T cells by injecting micrograms of the two agents directly into the tumor site. One of these agents is a short stretch of DNA called a CpG oligonucleotide that works with nearby immune cells to amplify the expression of an activating receptor called OX40 on the surface of the T-cells. The other agent is an antibody that binds to OX40 and activates the T-cells to lead the attack against the tumors. Because the two agents are injected directly into the tumor, they activate only the T-cells that have infiltrated it. In effect, these T-cells are prescreened by the body to recognize only cancer-specific proteins. Some of these tumor-specific activated T-cells then leave the original tumor to find and destroy identical cancers throughout the body. The approach worked remarkably well in laboratory mice with transplanted mouse lymphoma tumors in two sites on their bodies. Injecting one tumor site with the two agents caused the regression of both the treated tumor and a second, untreated tumor. In this way, 87 of 90 mice were cured of cancer. Although cancer recurred in three of the mice, the tumors again regressed after a second treatment. The Stanford researchers saw similar results in mice bearing breast, colon and melanoma tumors. Mice genetically engineered to spontaneously develop breast cancer also responded to the therapy. The researchers found that treating the first tumor that arose often prevented the occurrence of future ones and significantly increased the lifespan of the rodents. Medical advances in tumor treatment have not kept pace with the striking decline in cardiovascular deaths that have occurred in the last half-century. Without new therapies, cancer is on track to replace cardiovascular disease as the leading cause of death in the United States and other developed countries. This technology shortfall has changed, as advances in medicine have transformed cancer therapy. The mainstays of cancer treatment have long been surgery, chemotherapy, and radiation therapy. While these procedures save lives, most physicians and scientists have shifted their focus to advanced tumor treatments such as immunotherapy, the field that Dr. Levy has expanded greatly. Chemotherapy has long been a common cancer treatment and uses toxic drugs to kill tumor cells. Chemotherapy drugs are poisons, and the idea behind chemotherapy is to give just enough of it to kill the tumor without killing the patient. Radiation therapy works similarly to chemotherapy and uses toxic radiation to shrinks tumors. The idea behind radiation therapy is to target it to the precise location of the tumor to minimize damage to surrounding tissues. The problem with both chemotherapy and radiation therapy is that they are highly toxic and often destroy a patient’s stem cells in the bone marrow. Doctors then perform stem cell transplants to restore these cells in cancer patients who have had theirs destroyed. Surgery is an attractive option because a surgeon removes the tumor from the body. The procedure has its drawbacks because even the most gifted surgeon can’t always find and remove all of the tumors. One of the ideas behind Dr. Levy’s cancer ‘vaccine.’ is that it can be combined with surgery to get rid of the cancer cells that surgeons leave behind. Dr. Levy hopes oncologists will someday combine this new cancer ‘vaccine’ with conventional surgery. Breakthrough cancer immunotherapies to be ‘curative’ by 2025 says research head. Scientists develop cancer-seeking nanorobots that search out and destroy tumors. CAR T-cell therapy to treat lymphoma shows promise in cancer treatment. Precision cancer treatment trials report good results in treating tumors. Krista Conger. “Cancer ‘Vaccine’ Eliminates Tumors In Mice.” Stanford University [press release. Jan 31, 2018. Diagnosis, Treatment, and Advice: This article is intended for educational and informational purposes only and is not a substitute for qualified, professional medical advice. The information and opinions provided herein should not be used during any medical emergency or for the diagnosis or treatment of any medical condition. Consult a qualified and licensed physician for the diagnosis and treatment of any and all medical conditions. Experimental treatments such as experimental immunotherapies or cancer vaccines carry a much higher risk than FDA-approved ones. Dial 9-1-1, or an equivalent emergency hotline number, for all medical emergencies. As well, consult a licensed, qualified physician before changing your diet, supplement or exercise programs.